There has been a lot of discussion these days about the necessity of maintaining the essential character of Redwood City’s neighborhoods. 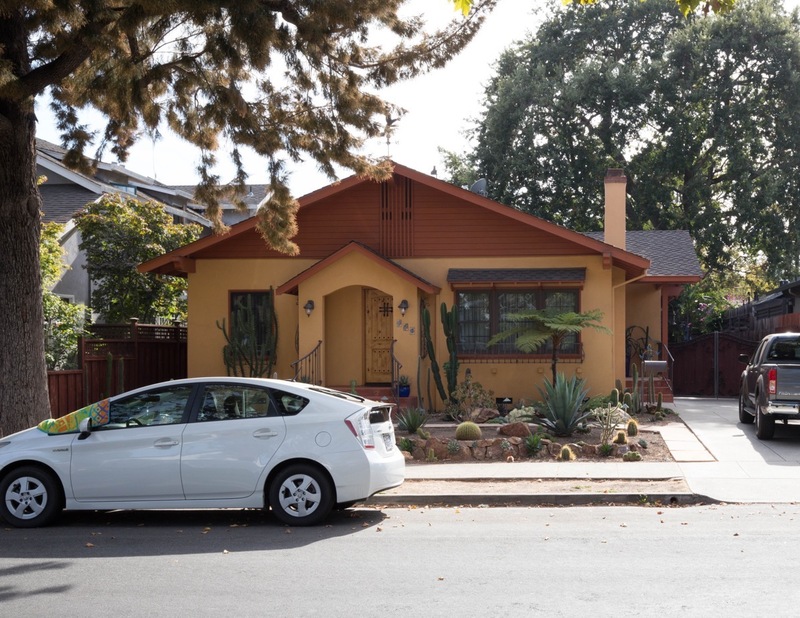 Much of the recent discussion has been spurred by the replacement of a handful of small, older homes in the Mount Carmel neighborhood with larger, modern homes that, depending upon one’s perspective, do or do not fit in with the remaining homes in the area. To better understand the nature of that discussion I naturally have been visiting the affected homes. Thus, when it became time for me to decide which neighborhood to next focus on as part of my ongoing series about Redwood City’s seventeen neighborhoods, Mount Carmel seemed the obvious choice. Although I don’t live in it, I walk through the Mount Carmel neighborhood quite often. That is because I live close to the neighborhood: whenever I walk downtown, or to the Woodside Road area, or to Stafford or Red Morton park, my most direct route is through Mount Carmel. I also walk through the neighborhood for the simple reason that it is a very pleasant place in which to walk. 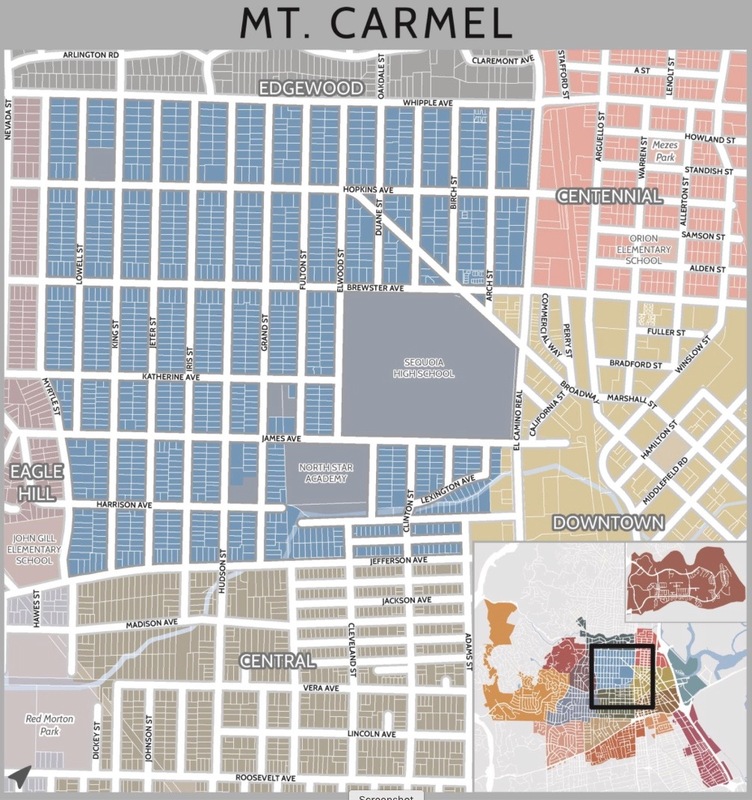 The Mount Carmel neighborhood is just over a half-square-mile of mostly single family homes. It also contains three public schools, two parochial schools (along with their associated churches), one large park, a couple of “parklets,” and one fire station (just barely, at Myrtle Street and Jefferson Avenue). A branch of Redwood Creek, known as Arroyo Ojo de Agua, runs through the southeast portion of the neighborhood. The area in blue in the above map indicates the Mount Carmel neighborhood. As you can see, it is roughly a square, bounded by Whipple Avenue to the north, Myrtle Street to the west, and Jefferson Avenue to the south. 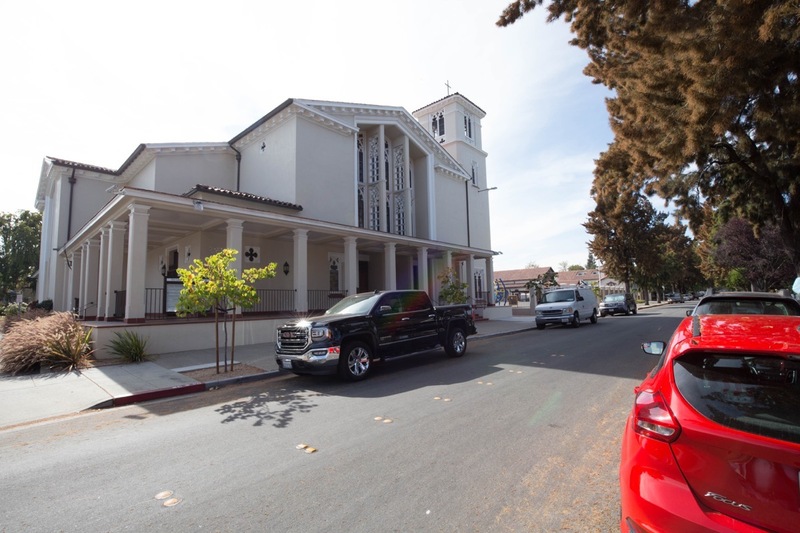 The east side of the neighborhood is basically defined by El Camino Real, but the edge of the neighborhood jogs a bit here in order to ensure that the retail businesses along the west side of El Camino Real are not included in Mount Carmel. Instead, those businesses are counted as part of downtown Redwood City. Mount Carmel may not be home to any businesses, but it does contain a handful of schools, the most prominent by far being Sequoia High School. 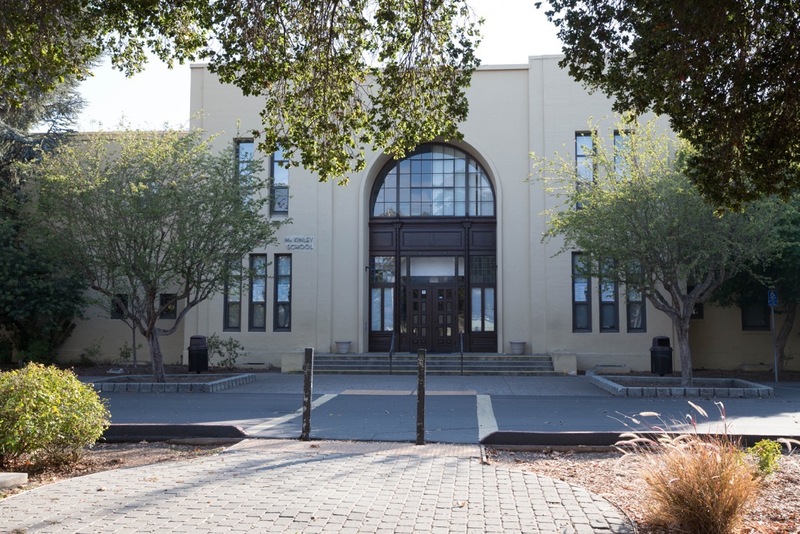 Sequoia High’s campus today looks like the campus of a small college, but back in 1924 when it moved to this location, it consisted primarily of just the main building and the auditorium (which today is known as Carrington Hall). 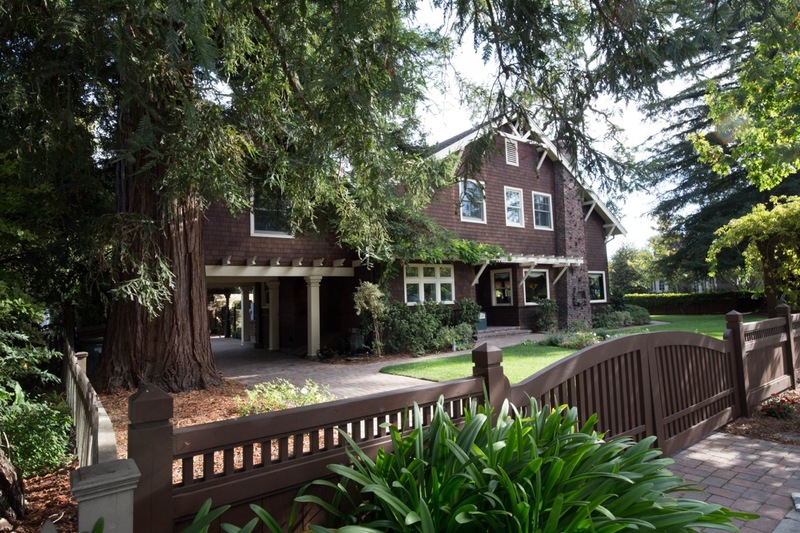 Sequoia moved here in 1924, but it goes back a lot farther than that: it was originally founded in 1895, when it was the only high school on the Peninsula between Santa Clara and San Francisco. Originally it shared space with Central School, in a downtown building that stood where the Fox Theater is today. Later it moved to its own building located where today’s Century Theaters can be found. Sequoia’s population back in 1895 was just 53 students; it has grown just a bit, to where today the school serves some 2,200 students. McKinley’s campus-mate, North Star Academy, has about 550 students spread across grades 3-8. That school is located primarily in two newer buildings: one is at the corner of Duane Street and Harrison Avenue, while the other is directly behind the first, along Harrison Avenue (but separated from it by an open channel carrying the creek that cuts through this part of the neighborhood: Arroyo Ojo de Agua). Due to their close proximity to one another, these three schools are known to cause traffic headaches for the surrounding residences. In the morning and in the afternoon residents of the Mount Carmel neighborhood who live along James Avenue, Duane Street, and Harrison Avenue, especially, have to share the streets with cars and buses that are dropping off and picking up students. 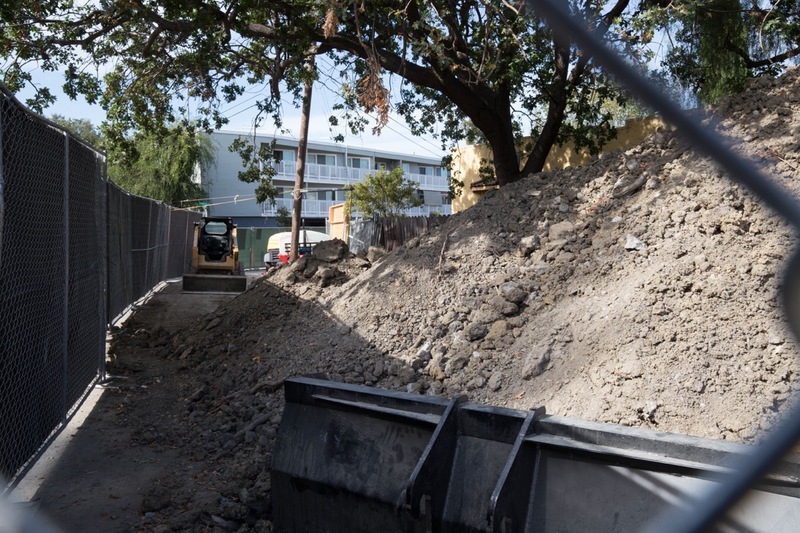 This issue was particularly highlighted when a local developer proposed and received approval for a 17-unit townhouse complex that he plans to build on a site that today contains seven single-family homes. These new townhouses are to be located at the corner of Harrison Avenue and Cleveland Street, directly across the street from North Star Academy. Neighbors are concerned not only about construction traffic, but also the traffic that will result from the ten additional housing units. As area residents are well aware, Sequoia High, McKinley, and North Star aren’t the only schools in the neighborhood. Along Grand Street, which neatly bisects the Mount Carmel neighborhood, there are two highly acclaimed parochial schools along with their affiliated churches. At 301 Grand is Our Lady of Mount Carmel Parish and School. The school is a private Catholic school serving grades Pre-K through eight. 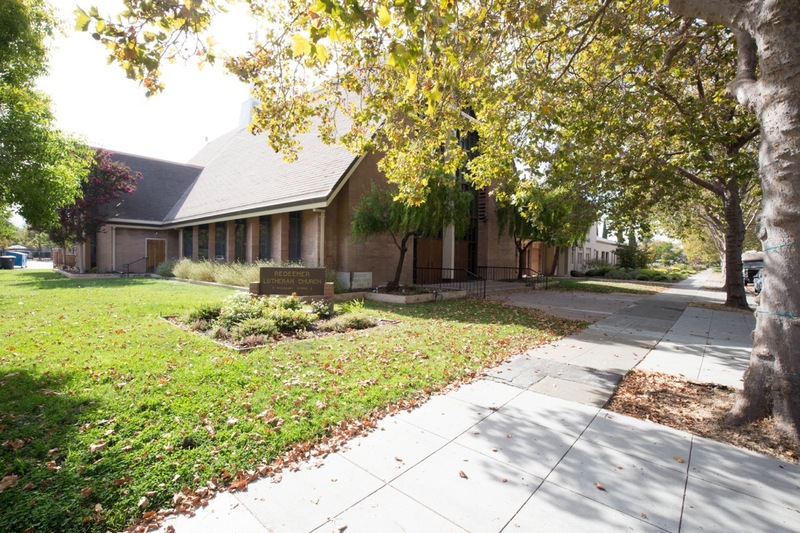 Originally founded in 1885 at the corner of Brewster and El Camino Real, the church and its school moved to its current location in 1932. Just down the street, at 468 Grand, is Redeemer Lutheran Church and School. It, too, is private, and serves children in grades K-8. In addition to its five well-known schools, the Mount Carmel neighborhood is also home to the 1.6 acre Stafford Park. Located on Hopkins Avenue between King and Lowell streets, this popular neighborhood park boasts a variety of play equipment as well as a large grass area. Because the park has bathrooms, picnic tables, and a handful of barbecues, it is a popular place for gatherings both small and large. 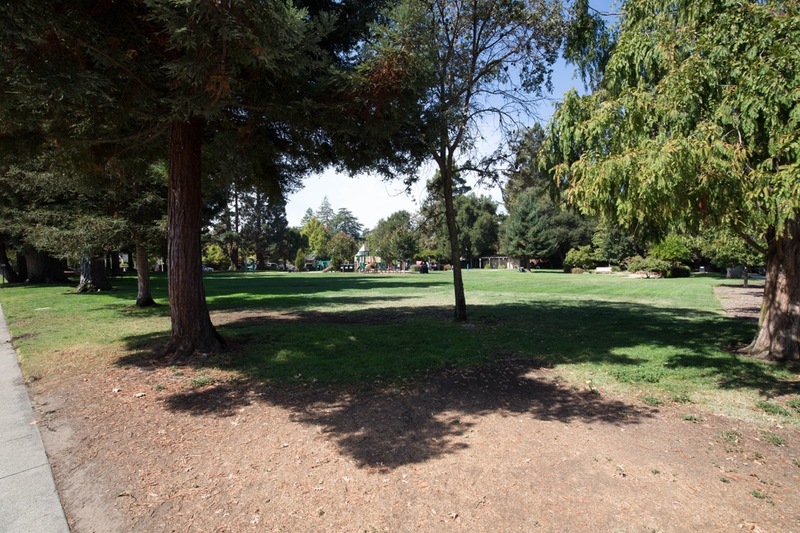 For those who don’t live in the immediate area, Stafford Park is probably best known as the location of Redwood City’s popular “Music in the Park” series of summertime concerts. Technically, Stafford Park isn’t the neighborhood’s only park, but it is the only one of real size. In the small triangle bounded by Hopkins Avenue, Broadway Street, and Duane Street there is a park of sorts, but it has little more than a bench or two on its grass surface. Getting to it is a bit challenging given that there are no marked crosswalks from any of the corners to the park itself, but fortunately the streets are single-lane here, so you only need a gap in the traffic in order to get to the park. I often walk by this park and occasionally sit for a moment if I need a break, but I rarely see anyone using it other than perhaps a dog walker or two. There is another small triangular park just about two blocks down Broadway Street towards downtown: in the triangle bounded by Brewster Avenue, Broadway Street, and Arch Street there is a small “parklet” that seems popular with Sequoia High students. This makes sense, given that the park is directly across from Sequoia High’s main entrance. This park is slightly mounded and mostly covered with grass, although it has two walkways cutting across two of the park’s corners. Some low concrete walls provide places for the students to sit. The Mount Carmel neighborhood’s wide tree-lined streets just add to the pleasure of looking at the many varied houses and yards throughout the area. If you enjoy looking at houses, as I do, you can’t do much better than taking a random walk along almost any of the streets in this neighborhood. Before summing up, I should say a bit more about the neighborhood’s one somewhat interesting geographic feature: Arroyo Ojo de Agua. I say “somewhat” interesting because in this neighborhood this tributary of Redwood Creek is housed in a concrete channel. Arroyo Ojo de Agua is a perennial creek: it flows year round, unlike many other creeks on the San Francisco peninsula. Arroyo Ojo de Agua starts well outside the Mount Carmel neighborhood: it flows for nearly a mile through Stulsaft Park (and there it runs in a natural channel, unlike in the Mount Carmel neighborhood), flows beneath Red Morton Park, and enters the Mount Carmel neighborhood at the intersection of Jefferson Avenue and Grand Street. It is still underground at this point, though, only surfacing about a block northwest of where Fulton Street meets Jefferson Avenue. From there it turns and parallels Harrison Avenue, only diverging significantly when it gets close to El Camino Real. As I was exploring the Mount Carmel neighborhood I followed the creek for a bit. 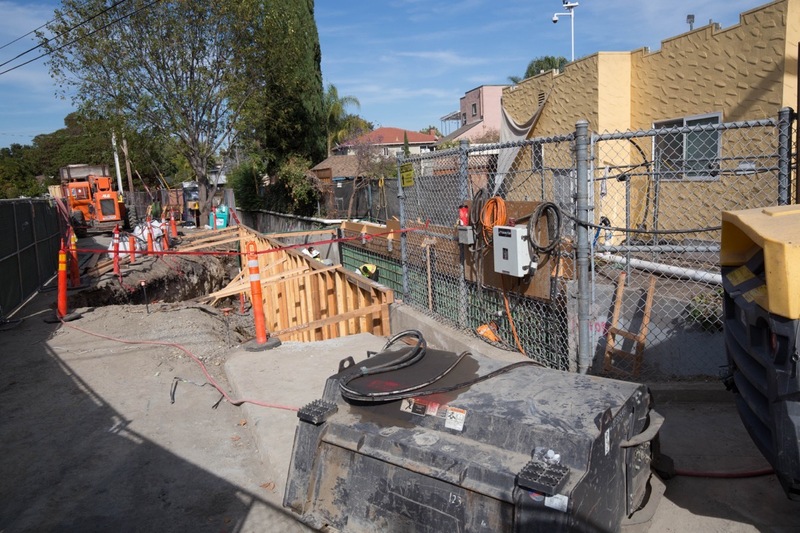 I was particularly interested to note the progress of the so-called “Redwood Creek Improvements Project – Jefferson Branch”; this is actually a project to rebuild part of the concrete channel that houses Arroyo Ojo de Agua near the corner of Clinton Street and Lexington Avenue. As you can see, the Mount Carmel neighborhood, although entirely residential (if you allow schools and parks in the definition of “residential”), is nonetheless a neighborhood of wide variety. It is full of old houses, new houses, large houses, and small houses. There are single family homes, duplexes, small apartment buildings, and even a couple of large apartment buildings. Its close proximity to downtown and its schools help to make the Mount Carmel neighborhood a wonderful place in which to live. Even for those of us who don’t live there, though, it is a wonderful place to walk or drive through. And since Stafford Park is a public park, we all can enjoy that part of the Mount Carmel neighborhood, too. As for the essential character of the neighborhood, well, I find it a bit hard to pin down. 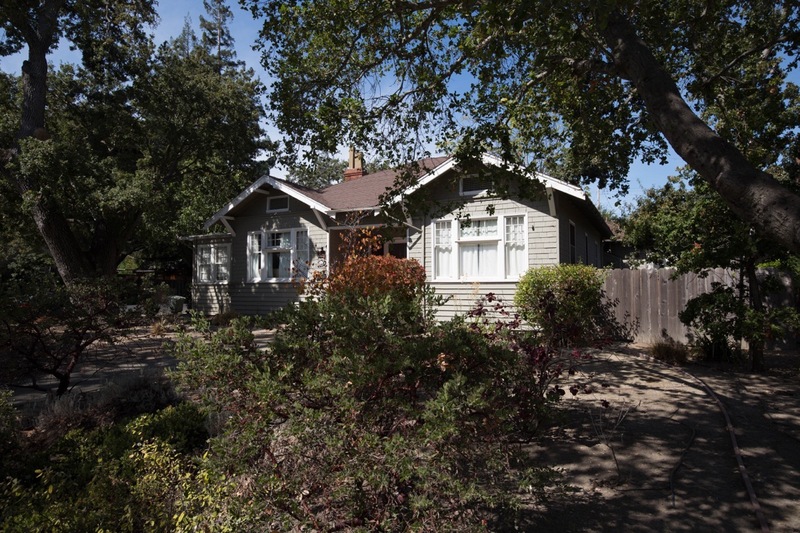 There are a number of older homes, although many aren’t what you necessarily would call “historic.” And over the years so many of the homes have been either remodeled or replaced that there no longer seems to be much uniformity among the neighborhood’s homes. The majority still appear to be older single-story homes with free-standing (usually one-car) garages in the back, but that majority is no longer as overwhelming as it presumably once was. 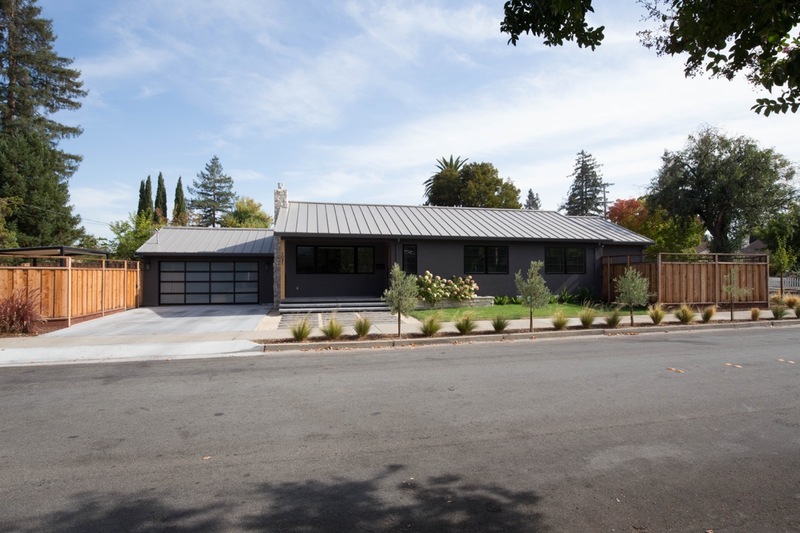 There is a comfortable, residential feel to the neighborhood that certainly is worth preserving, but just how we do that while still allowing people the flexibility to remodel or build homes to suit their needs is a discussion I’ll leave for another day. For now, I’m just glad that Redwood City’s Mount Carmel neighborhood exists, and that I can spend so much time walking through it. I have lived in the apartment complex on Harrison Ave (at Clinton) for well over 5 years. The property management company is in Loomis, keeps rent affordable (ish) and leaves tenants alone, in exchange for providing zero upkeep on the building. The window in the dimly lit stairwell has been leaking for 4+ years, there are urine stains on the wall in the carport that have been there since 2015, and occasionally we’ll find a used syringe or two in the communal, unlocked laundry room. When I bring these things to management as habitability issues, they tell me that if I find the place uninhabitable, I should find a new place to live. Do you know why I don’t? Because Mount Carmel is an amazing and safe neighborhood (once you leave the general proximity of my home). I guess that is a real testament to the Mount Carmel neighborhood (which I agree is a terrific place to live in general). But boy, I’m truly sorry to hear about your horrible-sounding property management company; that just sounds awful. I don’t know why people have to be that way: they’re in the business and should at least be making some effort to take care of their buildings and ensure that they are reasonably safe. I hope that the rent really is low enough to compensate… I’ve seen a lot of beautiful apartment buildings lately, having toured some of the very recently built ones, but you of course pay for what you get: they aren’t what I would call cheap. They do look clean and very safe, though. And they are all just as convenient to shopping and transit as your building is. You are of course highlighting a real need here in Redwood City: reasonably priced, decent quality housing. We have plenty of high-end rentals, and we’re getting an increasing number of subsidized (“affordable”) rentals, but we need more places in the middle. Non-luxury, somewhat reasonably priced, apartments. But the economics of such a place just don’t seem to pencil out these days, unfortunately.